Barcelona, the Mobile World Capital. Posted in: Business Issues, Internet and Mobiles. Tagged: Barcelona, Helsinki, Mobile Market, Start-Up. It has been pleasure to be back in Barcelona again after a long journey back and currently I’m setting myself again inside Barcelona mobile community. So, last week I attended NSBarcelona (iOS developers in Barcelona) event and AppCircus event. I was extremely disappointed about AppCircus. There where several innovative projects presented to Barcelona mobile app competition. One guy has figured out how to put sound to JPG picture format (pictures with sound app) and another had written ticket reservation app which uses 3D image of the venue so you can really see what kind of visibility you have on that spot before buying a ticket. But the winner was some MoSoLo (Mobile, Social, Location) network app which since launch of 2010 had got around 10,000 members, had raised first round capital of 160,000 from public funds and now raising €2M more… why those investors believe that Facebook model can be copied? Ah, what to expect from a jury that contains members (sponsors representatives) from middle management of FC Barcelona and Estrella Damm, the local beer factory? Sure, they are only interested how to increase their product marketing and not on technical innovation. Otherwise, the NSBarcelona event was nice. It’s a small community (usually some 20-30 developers attending) to show their work and have a beer together. No competition there. 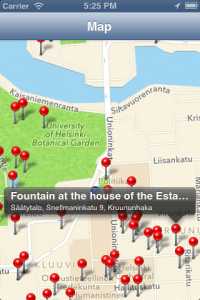 The winner of Helsinki city application (where I was started to write an app) will be announced today as well. However, I didn’t get back to Barcelona in time to finish this project and as I have figured out that they do not evaluate apps as they evaluate only video commercials for the apps. Doing a video I must spend probably more money that their award is. I had a professional guy in Sheffield, UK with his own equipment who could shoot those kind of things but last information from him is that he is shooting in Vietnam or somewhere and I have to pay his expenses. Doing a soundtrack, I have to be in Estonia as there is my friend willing to do it for something €500. Even I know several musicians in UK, they probably will ask thousands to do it so winning thousands and spending thousands isn’t much viable? Anyway, if I would have had those thousands to spend, I would have made the trailer for my film project which was needed to secure that half of the production financing from US source in 2010. That’s why I was deciding to put some mobile apps to the market to earn enough to have that trailer done at first place. Anyway, I have here totally rewritten the app with new UI and will need some people with iPhone in Helsinki to have a walk with it around the statues. The idea behind the app is still having a walking tours and register your walks so maybe I will find some business solution for it. Basically, I could use any city open database to have an City walking tour app so next time I would use some Barcelona or Paris as well. I just arrived back from CosmoCaixa (up in the mountains) where two days the bDigital mobile conference was held. At least the winner of local Entrepreneurship Centre (Barcelona Activa) award was an innovative app. City has increased the parking fees but there are lot of private parking spaces available. Practically cellars of nearly every building has their own multi level parking areas. So a guy had written an app that allows to sell those spaces instead of using public parking slots. I have been familiar with Barcelona Activa several years ago so probably I have to renew my contacts there if their interest nowadays is on digital sector. Previously I have been in small business starting courses where participants are mostly Tourism or Bar/Restaurant interests. I made them offer to setup the bungee trampoline and earn some income selling 5 EUR tickets to have 15 minutes jump that device. Local banks could have financed that equipment but asked around 10% personal participation which I didn’t had then. Maybe they have some grants for Research and Revelopment which could be used for mobile app nowadays? Anyway, in that congress I saw that one Pakistani guy is trying to do same things that I’m doing with object recognition and object skeletonisation algorithms. The guy had US business manager in the team as well. They had written an app that combines two pictures together so the person taking the picture could be in that picture as well. Practically if you have group of persons and one of them is taking the picture, another one takes second picture and app combines both persons to result. I hope to continue working with those algorithms as the summer has been busy for me travelling and writing some much simple database driven apps instead. It has been too hot for my brains to work on those kind of things anyway. Microsoft gave their own award to chinese language and culture learning a portal so obviously they are targeting now there with their lowest quality standards? I had to buy a new back bag and in Barcelona, the only affordable shops selling those Chinese ones. So my chinese back bag lasted only few days this time. The previous chinese one was much better lasting few weeks but I still hope to have an back bag lasting in years. I expect someone to sponsor a education to Chinese people how to build things that last longer and not take over their working culture to Europe? Anyway, as Microsoft is dead company probably their only hope is to go to China. But never again I would buy a chinese back-bag and Microsoft products. Somehow, I missed the financial app awards ceremony there sponsored by CaixaBank. They had 48H Hacketron on 22-23 November but as I didn’t had any financial app ideas by the time and they expected team as well, I wasn’t able to participate there. After the bank guy presentation he started to show one video so I went to have an cigarette… hopefully I will find out from their website which kind of app idea won. If I would have had a team and good financial app idea, I could have tried the PayPal competition in Barcelona as well. Anyway, the third organisation I’m aware running those kind of mobile app competitions (WIP-JAM) haven’t been much active in Europe lately. They had competitions in Paris and Berlin when I was on the road back to Barcelona and even wasn’t thinking to go back to north again because of cold and rainy weather. Now, when my friend Thibaut (a French guy) has left the organisation Caroline Lewko is from US does mostly US and Canada events. Sure they will be here in Barcelona during Mobile World Congress in February because Barcelona still is the Capital of Mobile World. But I need a congress ticket to participate in their event there, so without a sponsor I have the only possibility to get some free drinks in their networking event. Meanwhile, I will try to launch my iPhone music app before Helsinki Tour. The Apple developers account has finally been sorted out after several months of trying (it’s extremely difficult nowadays to get developers partnership with Apple), so I have to find enough people willing to take a look on it before I will decide to offer it to the iTunes store. Even there is a lot of competition in music apps (there was a one even presented in current bDigital event), I still believe that at the moment this will be my first choice to get to the market. If really 10,000 users are nowadays worth millions as AppCircus jury has decided, sure could win their award as well. Anyone interested to test it on his/her iPhone? Anyway, it has been a good time to get back myself to the business again here in Barcelona and I was happy to visit Finland and Estonia as well. But taking my business there is out of question. Barcelona is the place to be if you wan’t to the mobile market and UK is the most least place in the world on mobile, so Finland and Estonia could be somewhere between.